Or you can find the final version of my original pep files here. In fact I've already converted back the entire suit to *.obj file, since thinking "foam" means getting rid of a plenty of useless meshes that are normaly kept for paper-peping, and adding many others to flatten any detail that can be implemented afterward. Also will your model know some minor edits to fit foam speed-building. Be sure I'll be civilized and respectful whith him, it's painless he won't be hurt. Is your site down? I'm having trouble pulling the files. A clue : when my host is down, my pics are not displayed neigher. Gotcha. I'm behind a firewall at work so I just figured that was the reason the pictures weren't showing up (most don't, if they're hosted on a site like flickr, tumblr, or photobucket). Hello JF! I just looked at your post and decided to star building my own very first foam costume - people tell me I do look a bit like Tony Stark, so why not have an armor to show off, too? Thanks for modifying those files and all your tips, they are awesome! nice work how much time take to you to build all costume? awesome stuff JF makes the foam building process so much simpler however I have found that with the larger pieces I am having more waste foam. Be sure I would love having built them all... Currently I can't even find time enough to unfold. Tonight I'll upload the mkIII package, from Dancin_Fool's model, and before the end of august I'll share a partial Iron Woman, and the classical IM comic version. That's all I can do presently. Real life takes so much time. I often combine them together by a shot of glue to obtain a bigger usable piece. I'm so foxy. Can't wait for the MkIII files! That'll be the next suit I work on. Whoop iron woman. My bird is gonna be lookin hot! Dancin_Fool's Iron Man MkII/MkIII- JFcustomized foam files. Great job on simplifying the model. I'm really looking forward to seeing some builds! I'm on this once I recover from knee surgery! Any chance of you tackling any of the MkVI pieces? I'm almost finished with the upper torso (everything from the cod up, less the helmet). I am waiting until the very end to do the helmet because I want it to be as perfect as possible. I am using Stealth's files, but would love to see what you could do with the MkVI helmet. Since the helmet is probably the biggest focal point of the suit, I want it to be the best it can be. 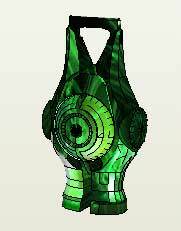 In fact, MkVI is the same as MkIV, eccept for the brace and the chest part that need a triangular hole to receive the triangular arc reactor. Therefore, you can pick up any other file you want from my MkIV files package. Including the helmet. Good to know. I haven't actually compared the suits Mk to Mk very closely. Looks like I'll be messing around with your MkIV helmet soon, then.